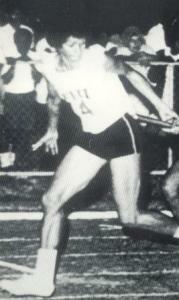 Born in Lautoka in 1937 Torika Varo as she was known then, had a long and quite a remarkable career in athletics. She started competing around 1952 and represented Lautoka from 1953 to 1957 in 50 yards, 100 yards, 220 yards and long jump. By 1956 Torika held records for 100 yards (11.6 seconds) and 220 yards (26.5 seconds). In 1958 she took time off from athletics to get married and have a family. Six years and four children later, in 1964 Torika returned on the tracks and walked her way into the Fiji Athletics Team to New Caledonia in 1966. In New Caledonia for the second South Pacific Games, she was in an unbeatable form, winning a gold medal in 100m in a time of 25.3 seconds, a gold medal in 4x100m relay and a bronze medal in the long jump with a jump of 5.09m. Torika returned to the South Pacific Games held in Port Moresby in 1969 at the age of 32 and picked a silver medal in 400 metres in a time of 59.4 seconds, and a bronze in 100m in a time of 13 seconds. Her 100m Native record of 12.0 seconds set in Suva on 19 November 1966 still stands at the time of her induction. Perhaps Torika is best remembered for her achievements in Noumea in 1966 where she was dubbed `Fiji Flying Housewife’.